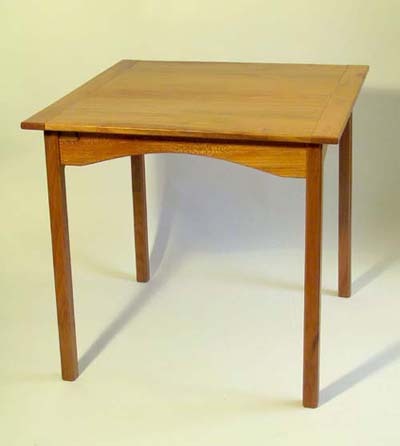 This table was the result of a bit of bad "by eyeball" measurement when I designed the round cherry table. At the time I made it my kitchen was far from completion (it is still not done but has come along a bit) and I was using my imagination as to how far a peninsula would stick out and how much room would be left for a table. It seemed right at the time but after the fact the space was too tight to accomodate the round table usably. At that point I knew that I had company coming to visit and I'd need somewhere for us to sit down to eat. Thus I designed this small table of more-or-less cafe size. It is just big enough for four to sit at for a light meal. The table is made from some locally harvested sycamore that I actually took part in sawing into lumber. After that I dried the wood in my basement. The tree the wood came from was standing dead and had been attacked by some sort of beetle which had left the sapwood massively mined by huge white grubs the size of my little finger. The majority of the sapwood was cut away and discarded leaving mostly heartwood. The state of the tree left quite a bit of spalting (fungus staining) throughout. The design is as simple as can be imagined. The top is two boards approximately mirror matched and has breadboard ends of largely quartersawn wood. The aprons join to the legs with mortice and tenon joints and have a gentle arch cut into their bottoms to allow one to sit a bit closer to the table. 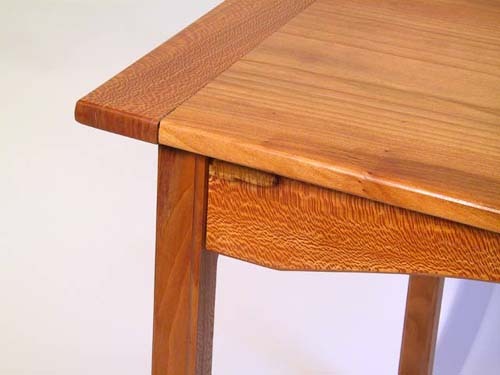 The legs are simple untapered squares with a bit of a cove routed into the corners to lighten the appearance. The finish is General Finish's SealaCell to bring out the figure with a couple of applications of Arm-r-seal for protection. Overall size is 32 X 32 X 30 inches. Sycamore wood has a reputation of moving wildly with humidity changes and for this reason many people won't use it. Others that who do use it only use the quartersawn stock which is more stable. I never believed that it could be as bad as portrayed and assumed that with proper design and construction details that any wood could be used for furniture. Well, in this project I came to face how wild this wood could be. Even though all of the stock had seemingly adjusted to ambient moisture there has been some great movement taking place. Within a few months of making the two boards that make up the field of the top had shrunk leaving the the breadboard ends proud by &frac18; -inch on each edge. Before my company came I trimmed those protrusions off and retouched the area. Since then the field has shrunk by an equal amount. This time I'll wait for a while longer in an attempt to determine if there will be seasonal movement before repeating the trimming. This picture gives a detail view showing the grain of the wood, some spalting, and the result of the shrinkage of the top.